Hi Lawyers, how’ve you been? Well, my real name is Law Society of Upper Canada. Some people call me, “The Law Society”, but we can drop the formalities, right? Just call me LSUC. Listen, I know we’re not as close as we could be, and I know I typically only call when I want something (like fees, CPD reporting, an annual report, maybe a practice audit, etc…) but I really need your help. You see, we’re holding this election. It only happens every four years, but it’s kind of a big deal. There are, like, 96 lawyers across Ontario that want to support LSUC’s mandate to advance the cause of justice and protect the public interest by serving as Benchers. 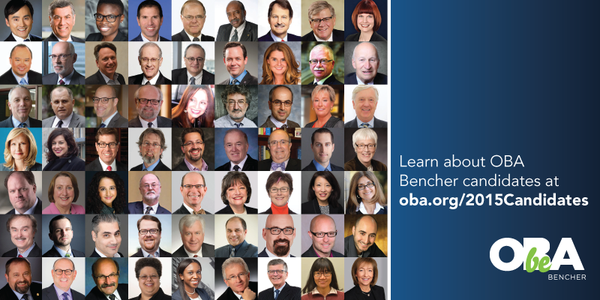 Benchers are like the Board of Directors, so they oversee our $100M operations, but they are also Governors, adjudicators and committee members that establish polices like your code of conduct, professional competency standards, and stuff like that. Uh oh…have I lost your interest already? The thing is, I’m really worried. There’s like, nearly 50,000 of you out there and I’ve been trying to get you to vote since last Monday, but as of yesterday, only 8500 of you did. Look, I don’t want to play to stereotypes about lawyers not being good at math, but that’s like, um…., only 17% of you. I’ve been trying to get your attention about this election, and I think a few of the candidates have too. Heck, I know they have. After all, why else would so many of you be complaining about endless emails, letters, tweets and other campaign nuisance? Sorry, that wasn’t fair. I can’t blame you. After all, I’m writing to ask for your help. In 2011, about 37% of lawyers voted in the Bencher election. With those Benchers in place, LSUC established the Law Practice Program, studied Alternative Business Structures, reviewed the accreditation request of Trinity Western University, studied the challenges faced by racialized licensees and women in the profession, spent a ton of cash on some high profile disciplinary matters. We did a bunch more, but you get the picture. Now it could be that the 83% of you that haven’t voted are completely cool with all that we did and/or that you have full faith or are indifferent about how the class of 2015 Benchers will run things until the next election in 2019. But I hope you might want to be closer to what’s going on. I know I’d like it if we talked more and not only when I need something. But I really do need something this time. It’s really easy. Check your in-box or spam filter from April 13th. I sent you a note with a personalized link. A few clicks, 3-5 minutes and BOOM! You’re done! Ok, I realize I probably could have done more to make it this easier to figure out who is running, than putting together a giant PDF of 96 profiles (http://www.lsuc.on.ca/uploadedFiles/bencher-election-2015-voting-guide.pdf), so that’s on me. My bad. Luckily, a couple other places have put together some lists with more details from the candidates. These aren’t official and not all candidates, are listed, so it’s not like I’m endorsing them, but they still might help. Those keeners at the OBA even put together a big canvass with 63 candidate pictures. It’s cool, you know, if you’re in to that sort of thing. So, I hate to ask, but I’d really like your help with 2 things. And second, please bug your lawyer friends (you know, especially the ones that don’t like me very much and are always offering an opinion on what I should do) to do the same. It’s kind of embarrassing that I’ve only been able to get a third of you to vote in the past. Municipalities get more than that. Hell (oops, sorry, Heck! ), student councils probably do better. *Disclaimer: This may shock you, but I’m really not LSUC and I’m not authorized to speak for LSUC. I’m using satire, perhaps poorly so, but it’s intended as satire nonetheless. I’m just Colin Lachance, an LSUC licensee and Bencher candidate speaking on my own behalf. Is the Goal of the Future to Catch Up With the Past? Yes. Sort of. But only if by “the past”, we mean some idealized period when things were easier, cheaper, simpler and better. Apply those same adjectives to the future, and you will forever be chasing the horizon or the end of the rainbow. In discussions of access to justice issues or legal service markets, the present is the problem and the future looks even worse. For lawyers and the public we serve, everything is already too complex, too time or labour intensive, too expensive, too unjust, or just too hard. Accordingly, process improvement proposals or tech-driven solutions are not offered merely as a way to change course, but to reverse course. We never really wanted flying cars, did we? Sure it would be cool, but the underlying desire was to reduce/avoid road congestion. Something, according to Elon Musk in response to Neil deGrasse Tyson (NERD ALERT!!!!) that may be better accomplished using tunnels. In the context of legal services, the idealized past we hope to reach in the future is one where the solutions address the needs and challenges of the people we are trying to serve. It’s not much more complicated than that. Where it gets complicated is that we all have wildly different ideas about which problems to tackle in which order and through applying which solutions. In a recent post, Ravel Law CEO Daniel Lewis recounts a story about a 1948 U.S. senatorial election campaign during which the legal advisors to a pre-presidential Lyndon B. Johnson set about finding a judge most likely to rule against Johnson’s interest. Read the full post for more details, including why losing was the objective. In Lewis’ telling, this was an early example of what his company currently enables – legal data analysis. For me, the story served as a reminder that the needs and wants of earlier periods are less subject to change than the suitability of the solutions we devise. When it comes to putting your best foot forward in court, the timeless need of lawyers and clients from any era is to present the facts and law in ways that resonate with the judge. In Johnson’s day, that was aided by the efforts of several lawyers poring through case reports. Today, Ravel Law uses a combination of big (legal) data and lawyer-informed algorithms to help predict what Judge “A” may or may not do in response to particular arguments. Tomorrow, they or someone else may design a better methodology. I’m a big fan and promoter of experimentation and innovation – particularly when it comes to legal tech and to rethinking legal service delivery models. I’m of the school that believes that when the challenges we face came about while we’ve been doing things one way, then it is worth exploring different ways of doing things even if we can’t yet be certain which path will lead to better days. On the tech side, we don’t need to embrace everything that comes along, but we do need to encourage the innovation. Rare is the technology capable of creating a need and corresponding market (tablets, fitbits, 3D home printers, and smart watches do come to mind here), rarer still the scenario where the originally conceived tech advances can hold their place in the market and the hearts and minds of consumers, undisturbed, for decades at a time (although microwaves and dishwashers are having a very impressive run). More common is the scenario where our desire remains relatively constant (e.g., watching movies at home) even as an ever changing array of solutions come and go (16mm film, VCRs, pay-per-view, DVDs, blue-ray, bittorrent, digital downloads, Netflix….???). Luddites though lawyers may be, we aren’t incapable of evolution. After all, most of us are now pretty comfortable with electronic legal research. But we do need to up our tech game as our worlds begin to change faster than Apple upgrades iPhone versions! I can’t tell you which current or future development will bring us close to the idealized past, but I do feel confident in suggesting that lawyers interested in making things easier, cheaper, simpler and better need to get engaged. I’ll go further and suggest that true engagement means looking beyond your own experience and industry for ideas and collaborators. I’ll go further still and suggest that the biggest barrier to reaching the idealized past is refusing to move forward and being part of that shrinking cohort that believes that the best approach lies in doing things the way you always have. If we truly want to recapture yesterday, we need to start building tomorrow today.